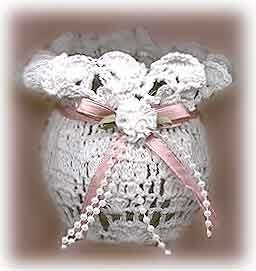 This feminine candle votive harks back to the Victorian love for lace and doilies. Simple and elegant, this candle craft is also very practical, because you can just remove the doily cover for washing. Lay doily flat and place votive holder bottom, at the center of the doily. Pull the doily up over the sides of the holder and wrap an elastic band around the rim to hold the doily in place. Leaving the elastic band in place, tie a ribbon around the rim [see photo] into a shoelace bow. Hot glue embellishments of choice to the ribbon only. Being careful not to glue directly onto the doily, will allow you to easily remove the doily for washing. Another alternative is to sew or pin the embellishments to the ribbon band before you tie around the rim of the holder. Copyright © 1999-2014Susan Spatone All rights reserved.